Edited by: H. Ekkehard Wolff, Orin D. Gensler. 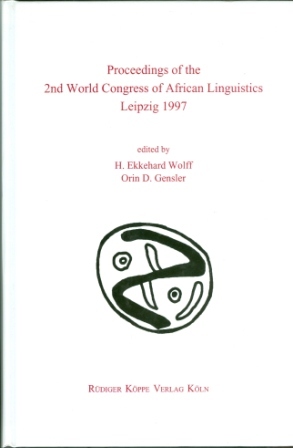 With contributions by: Mohamed H. Abdulaziz, Akinbiyi Akinlabi, Mahaman Bachir Attouman, Yiwola Awoyale, Ayo Bamgbose, Steve Barrett, Roger M. Blench, Jasmina Bonato, Sonja E. Bosch, Malami Buba, Malami Buba, Eugene H. Casad, France Cloarec-Heiss, Bruce Connell, Denis Creissels, Djita Issa Djarangar, Nikolai Dobronravin, Michael J.C. Echeruo, Francis O. Egbokhare, Okon Essien, Rachélle Gauton, Peter Gottschligg, Edgar E. Gregersen, Gerald Heusing, John P. Hutchison, Peter Kalchofner, Roland Kießling, Adrian Koopman, Andrew Tilimbe Kulemeka, Catherine Labroussi, Roger Mickala-Manfoumbi, Kamal Naït-Zerrad, Paul Newman, Robert Nicolaï, Steve Nicolle, Philip A. Noss, Knut J. Olawsky, Kenneth S. Olson, B. Akíntúndé Oyètádé, Paulette Roulon-Doko, Ronald P. Schaefer, Brian E. Schrag, Marie-Claude Simeone-Senelle, Henry Tourneux, Eno-Abasi E. Urua, Sr. Uwalaka, Lolke J. van der Veen, Martine Vanhove, John R. Watters, Kay Williamson †. 10 pp. Roman, 791 pp. [...] both scientific editors and Rüdiger Köppe Verlag deserve congratulations for this exemplary piece of work.